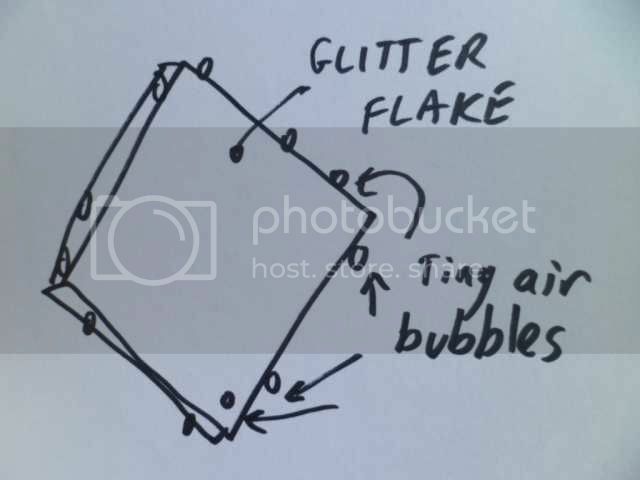 At the point of putting up this web-page on the 27th of April 2014 there is not a single article I can find on the Internet that reveals the chemical used in glitter lamps. So hopefully this will solve a riddle for many others who have been trying to make their own. Based on my findings I'd say that the "non toxic" description on many commercial glitter lamps is a bit vague. The chemical involved is used in some food processes, but is not advisable for consumption in large quantities. I've just actually tasted some right now, and it's VILE. A strong burning salty taste that probably means nobody in their right state of mind would try and drink it. Note that this version does NOT use the fast flowing and incredibly stinky chemical that some older American glitter lamps use. It also doesn't have their issue of the glitter adhering to the internal glass wall of the bottle. This project involves hot and mildly caustic liquids, glamorously glittery carpets with complete impunity to even the toughest vacuum cleaner and a small but still viable risk of the massive explosion of a glass container, showering hot caustic solution interspersed with broken glass and shiny glitter in all directions in a fabulous manner. As such, you do this project entirely at your own risk like a reckless showgirl. Here's what we're aiming for. 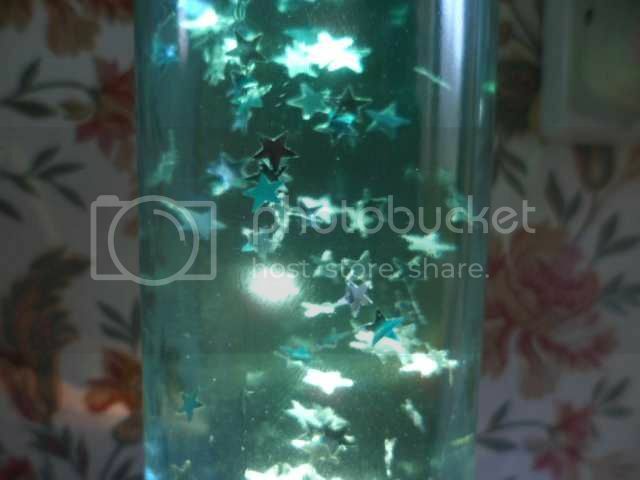 A glass bottle full of clear free-flowing liquid with glitter suspended in it that flows and sparkles under the influence of the heat from a lamp. So lets get some glitter and bang it into a bottle of water. 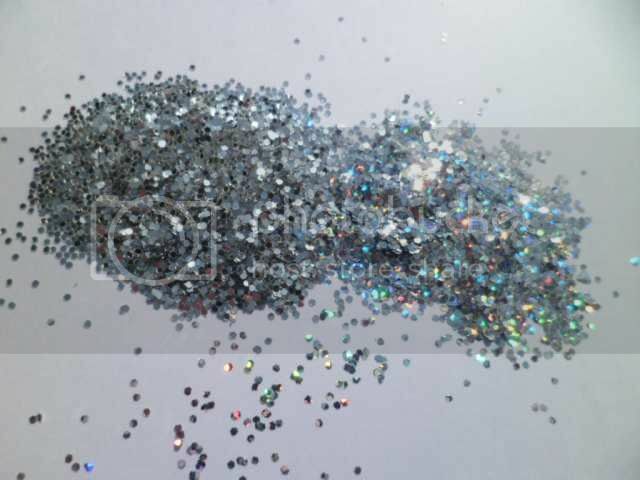 You can use any general glitter you can find, but not all are suitable as described below. Large complex shapes may be prone to tangling and interlocking. I like plain glitters and especially the holographic silver glitter. In my prototype I used little silver stars that were included in a glitter craft pack from Poundland (a dollar store). Oh dear, the glitter appears to have sunk forcibly to the bottom with absolutely no intent of moving even with a high power lamp under it. You see, it turns out that plastic is much heavier than water. This may surprise you if you've seen plastic items floating in the sea or rivers, but in reality it was the air inside the plastic object that was probably keeping it afloat. There are plastics that are close to the density of water, but they tend to be the translucent types that are not suited to glitter manufacture which require a hard clear plastic like mylar (polyester) for the best effect. It gets a bit more complicated than just the weight of the plastic though. The thickness of the metallisation also affects the weight and I discovered that with some glitters there was a very wide weight range between the particles in a single scoop from the same bag. To date my favourite effect has been using professional scenic glitter supplied by a theatre supply company called Rosco. Their fine cut hexagonal silver polyester glitter in 1/64" (0.4mm) flakes is incredibly sparkly. My experimentation in this area is ongoing though, and I'm continuing to research different glitter materials. So we have to add something to the water to make its specific gravity greater than that of the plastic glitter. And this is where it starts getting very tricky. I've been hunting the elusive chemical that can do this for literally decades, and have tried salt, sugar, glycerine, sodium hydroxide (which is dangerously caustic) plus loads of other soluble chemicals. And I've tried LOTS of different glitters to see if I could find a type that was physically lighter with no success. At the point of writing this article in 2014 the Internet still did not have an answer to the simple question, "how do I make a glitter lamp?". Sure there were loads of armchair experts announcing that you just mix glitter and water, or add some table-salt and that's it. But they clearly hadn't tried it. Like most other chemicals table-salt (sodium chloride) will only dissolve up to the point that it reaches a saturation point in the liquid and then no more will dissolve. At that point it is STILL not dense enough to suspend glitter. So one day I'm experimenting with different desiccants (moisture absorbers) and there's one called Calcium Chloride. It's a chemical that has loads of uses including as a firming agent for pickles, but it's most interesting attribute is that if you leave a bowl of it lying in a room, it will gradually absorb moisture from the air and turn into a syrupy liquid. This characteristic is why it's used in disposable dehumidifiers for cupboards, where it starts as a solid crystal in the top of a bag or container, and gradually turns into liquid that drips down into a lower section of the bag or container. It turns out that Calcium Chloride is so hungry for moisture that you can dissolve TONS of it in water and raise the specific gravity well up to the point that glitter floats. So I did a search again.... Calcium Chloride glitter lamp. Just to see if Google turned anything up. It didn't. But it did turn up an interesting if somewhat morbid article about an alcoholic who was admitted to hospital after setting himself on fire, and as other medical complications showed up they found he had ingested most of the contents of a glitter lamp during a drunken binge. 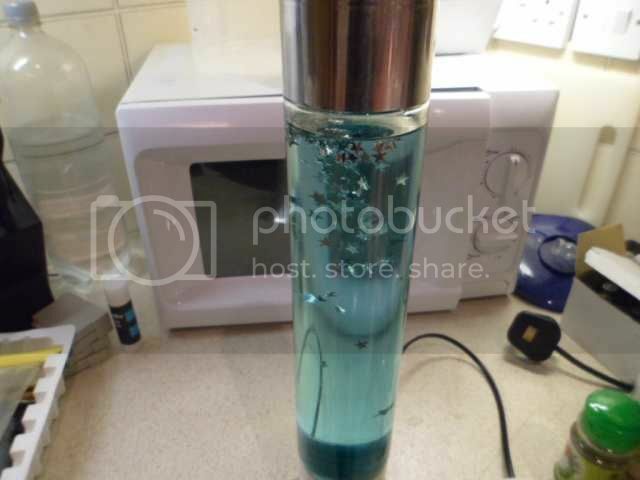 They tested the liquid and found it had a massive calcium content which was ultimately bad news for the alcoholic, but did at least confirm that the original liquid in many of these lamps is probably calcium chloride. 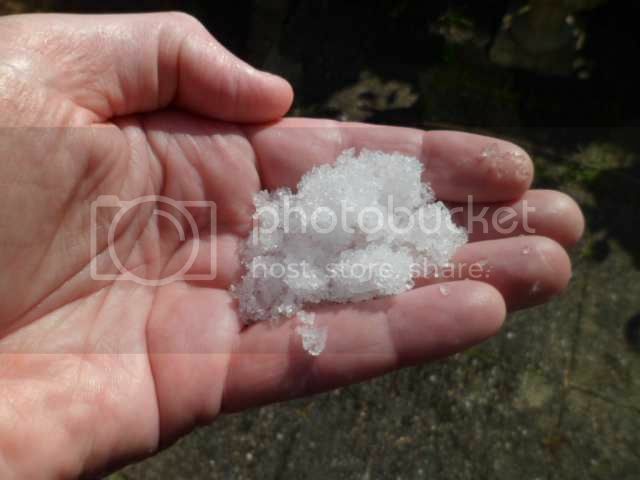 The picture above is a handful of Calcium Chloride hexahydrate. It's a bit caustic and can cause drying of the skin, so I wouldn't recommend handling it too much, but the picture shows how it comes in flake form. It actually feels quite nice, like an icy slush due to the inevitable water content. In fact you have to be careful to keep the bag or tub it comes in well sealed or it will turn entirely into liquid. 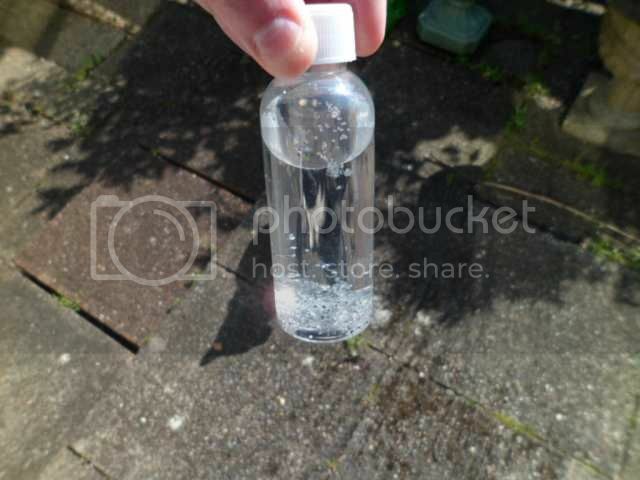 I bought mine on ebay as food grade Calcium Chloride hexahydrate. There are other versions like dihydrate and anhydrous, but I found the anhydrous stuff to be very impure, and had such good results with the high purity hexahydrate (6 molecules of water) stuff that I'd recommend it. Another source is in the aforementioned wardrobe dehumidifiers like the one shown above. 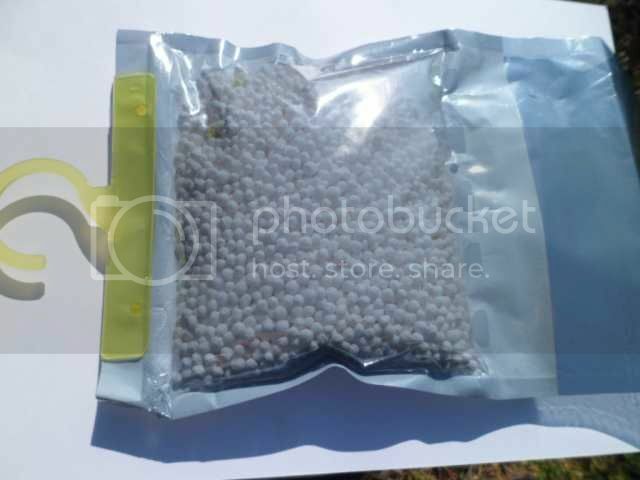 In this version a sealed plastic bag with an upper and lower section separated by thin channels is filled with Calcium Chloride granules in the upper section which has a breathable membrane. As moisture is absorbed from the space it liquifies the calcium chloride which then drips down into the lower section of the bag. Unlike silica gel units this type can't be recharged by heating, and is actually intended to be thrown out with the trash when full of liquid. The one shown above also had yellow "citrus aroma granules" which were not soluble. The calcium chloride in these units is often very impure, so may contain impurities that will affect it's density and settle out as a cloudy silt in the bottle. You could try using it and filter it, but I'd recommend using a good food grade version for liquid clarity and a guarantee of a decent final specific gravity once it's dissolved. Unfortunately, like all high solubility chemicals calcium chloride is slightly caustic and will corrode metal. Which is coincidentally what glitter is coated with to make it shiny! So it turns out that the glitter used in these lamps has to be a protected glitter that has the base layer of a hard plastic, a metallised coating that makes it shiny and a protective layer of resin that is applied to protect the metal from corrosion before the whole sheet is then cut into tiny pieces of glitter. 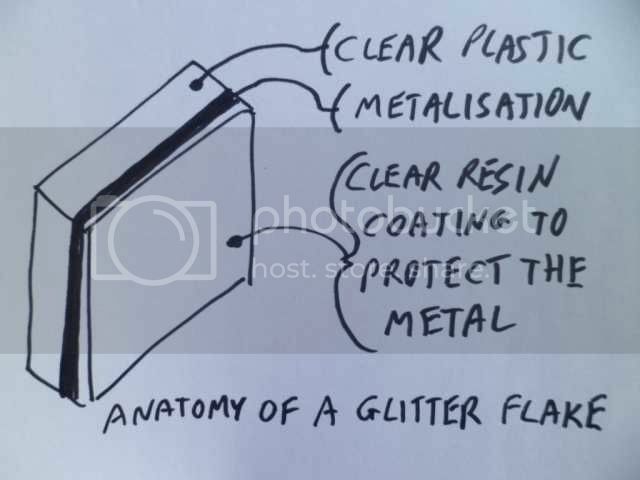 It makes manufacturing sense to apply the protective coating before the cutting process, but in doing so it means that once cut there is a tiny seam of the metallisation that is exposed at the edge of the glitter. In reality, even though the exposed metal does corrode it is such a tiny (molecular) layer that corrosion is VERY slow, although it may be visible in very old glitter lamps as a slight loss of the metallisation at the edges of each bit of glitter. Most good quality glitters seem to have the protective coating, but some glitters don't and that will become apparent very quickly if you make a nice glittery lamp and after some time it stops being glittery and all you have is little bits of transparent plastic floating in your liquid.... No problem. Filter out all the old stuff and try a different glitter. Although there may be an issue with the dissolved coating making the carrier liquid cloudy. But it's cheap enough to make another batch. If you're patient enough you could put some calcium chloride liquid in a small bottle with some sample glitter and leave it for a week to see if it's resistant to the solution. One of my favourite glitters is the silver holographic glitter that reflects a wide variety of incredible colours depending on the angle it's viewed from. Sadly it seems to be quite prone to corroding, perhaps due to the holographic effect being defeated by a protective coating. Getting the right density is very much trial and error, and it's probably easier to actually do the mixing in a bigger bottle (which can be plastic if desired). The ratio of calcium chloride to water is surprisingly high (about 4 to 1 by weight! ), so start with a small amount of water first and then adjust by adding either more calcium chloride if it's not dense enough, or more water if it's too dense. Note that after getting a rough balance between the liquid density and the glitter, some fine adjustment will be required. 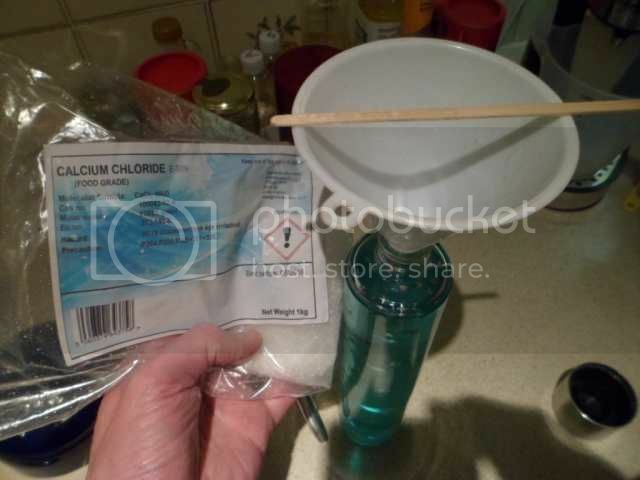 The general flake version of calcium chloride is naturally quite wet and sticky, so you may have to poke it down a funnel into the bottle with a coffee stirrer like I did. I'd recommend using pre-boiled water for sterility. You can add a drop of food colouring into the water if you wish, but for maximum shine clear liquid is best. When you add glitter it will initially be more buoyant at first due to tiny little bubbles of trapped air on the surface and edges. It's not easy to remove these bubbles quickly, but they will dissipate over time and the glitter that started off stubbornly at the top of the bottle will gradually settle into the same buoyancy as the rest. This does mean that you may have to fine tune the bottle by adding some more calcium chloride to get the settled glitter buoyant again. If the glitter clumps together you may find adding a single drop of clear dish-washing liquid to it helps avoid that issue. In its cold state the glitter should settle slowly to the top of the bottle. The actual density of the liquid required will depend on the type of light source you are going to use to operate it. A higher wattage lamp will make the glitter flow faster, but will also heat the liquid up and make it expand losing density as it does. This will make the glitter tend to sink, so you need to bias it to the top more by making the liquid denser to start with. For a lower wattage lamp you can make the density a bit lighter so that the glitter can easily get into motion from the top of the bottle. The fine tuning of density allows your lamp to be custom tuned to near neutral buoyancy for the glitter so that it will even move with a low power LED lamp under it. This gives a very slow but VERY bright and sparkly effect. And that's it. You have a custom and further hackable glitter lamp. This is a video of one I made using the fine Rosco scenic glitter balanced so perfectly that a 3W LED lamp makes it move and sparkle nicely. Note that for safety it's better to use a cork or other ejectable seal on the top in case the bottle gets pressurised for any reason, like being used on too hot a lamp that makes the liquid boil. Unlikely, but it's better to play safe.